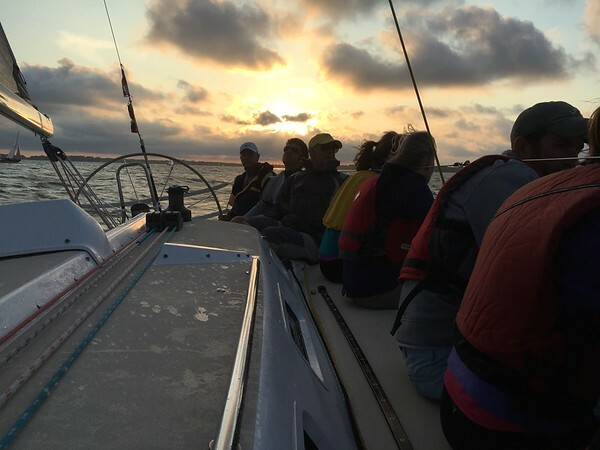 It was a cool, light air day for the 3rd installment of the Fall Series for the Offshore Division at Fishing Bay Yacht Club. Without many J/70s on the line and both my boat and Double Eagle short on crew – Andrew and I jumped on Double Eagle and I got to drive the day. All in all it was a fun day and we finished 2nd in both races. Thanks again to the Double Eagle crew for having me along! Today was quite a breezy day for the 2nd Offshore Fall Series day at Fishing Bay Yacht Club. Rather than get beat up in the cold and wet conditions most of the J/70s decided to bail and crew on bigger boats. I ended up on Mad Hatter. 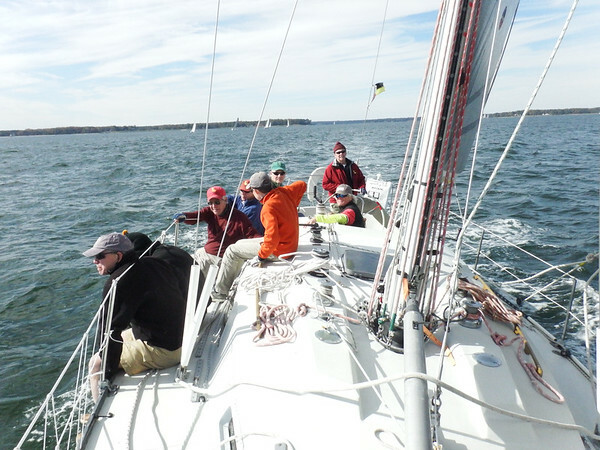 We sailed two races with winds in the low 20’s that eventually eased off a little bit in the 2nd race. I was mostly in the back of the boat helping trim genoa. 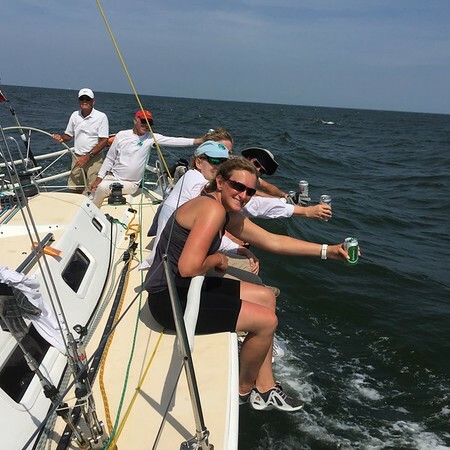 This year the Smith Point race was a bit of a slog with a 15-20 knot north wind. 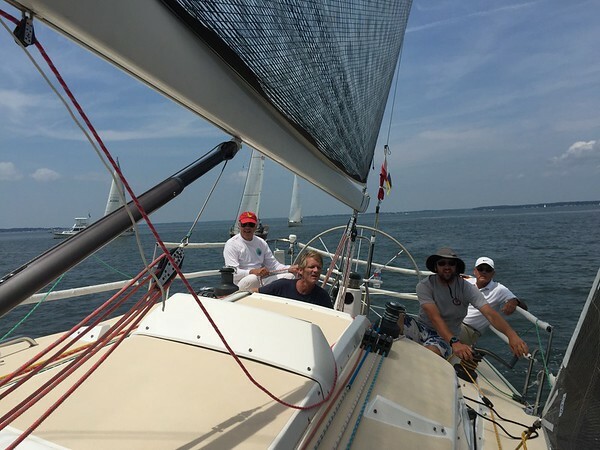 I sailed on Mad Hatter and this year we didn’t make it to Smith Point light house until around 9:30. But the spinnaker run all the way down the bay back to the Piankatank was quite nice. Arriving at nearly 1am we were one of the last to finish, but still corrected over everyone else out there who sailed the long course. Thanks again to Bob, Lisa and crew for having me along! It was an interesting Screwpile Regatta – the weather was moderate, only 1 onshore postponement for lack of wind, good racing and a ton of fun. On top of that we took half a boat of J/109 sailors and had them run a symmetrical kite with dip-pole jibes and check stays – not an easy set up to master. The boat is a Farr/Dickerson 37 Excitation and with a pretty quick learning curve – we were up and sailing the symmetrical kite with the best of them halfway through the first day of racing. 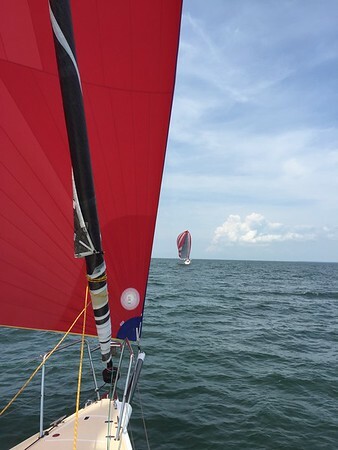 We also quickly found our spot in the PHRF-A2 fleet – most of the boats were sport boats with asymmetrical kites and all but one of them owed us time. As the longest, heaviest and tallest rig on the course – we were a fierce adversary especially on the starting line where we could sail higher and faster upwind and blanket anyone below us. In the first day of 3 races – we got 3rd place every time. Day 2 on Saturday featured a distance race. The first leg was a downwind start and there was just enough wind to run with the kite up against the current and get around the first leeward mark. Sailing upwind and south down the bay we stayed more to the left in the middle of the bay and found more wind. The highlight of probably the whole regatta was crossing all but 2 of the A1 boats on that leg. They would eventually pull away as the wind filled back in and they headed for a different windward mark. Even though the wind was light, the race was shortened and we were less than a minute out of 2nd place. On Sunday, we were postponed ashore for over an hour and a half before the wind showed up. When it did we had nice mostly-sunny skies and 8-12 knots of wind. Two more races were sailed and sure enough 2 more 3rd places. 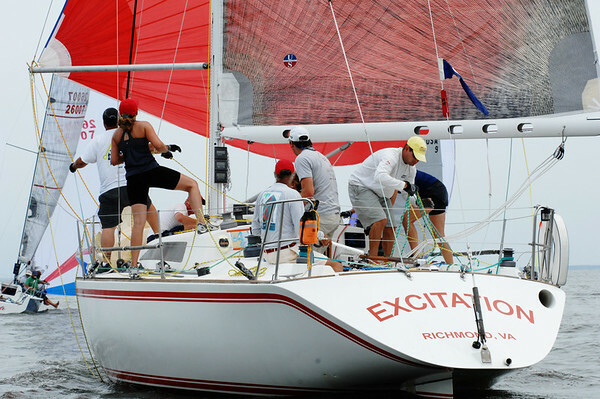 Things learned this regatta – I really liked the new B&G electronics that Mayo has put on Excitation. The 7″ screen on deck was able to show our past tracks as well as all kinds of boat information. I think I also liked that the wind instruments were broken all weekend – one less thing to distract us. 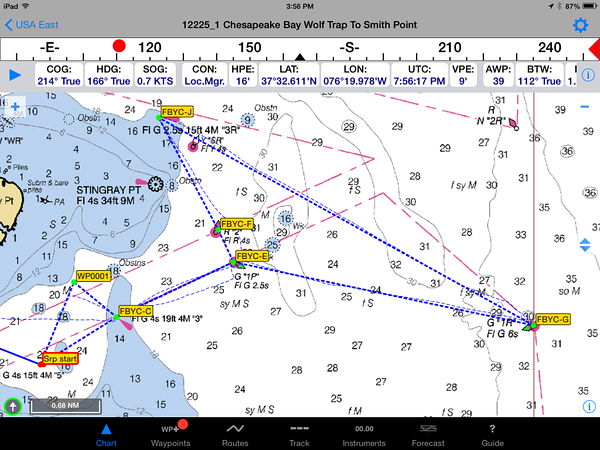 Beyond the track and other GPS-based information – we mostly drove the boat on the compass and spedo alone. Thanks again Mayo for racing and having myself, Mark, Melissa, Lauren, John, Chris, and Carrie along. It was a pleasure racing with all of you. 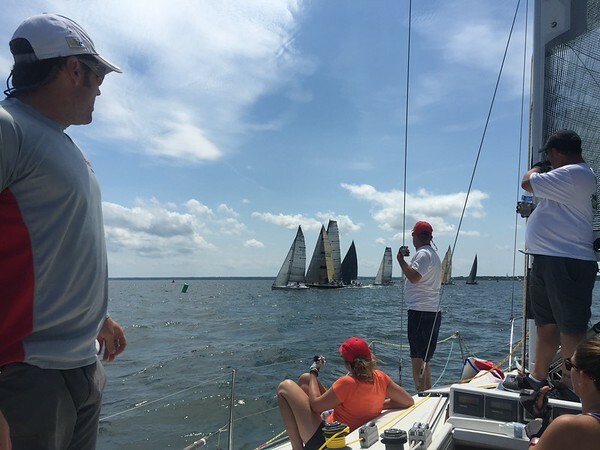 Saturday’s Cut Channel Race at Fishing Bay Yacht Club started out with extremely light wind and a postponement on the water. When the wind started coming in – it never stopped and slowly built to 25+ by the end of the race. It was no trouble for us on the J109 Double Eagle – we were well on our way to the finish by the time the wind really piped up. 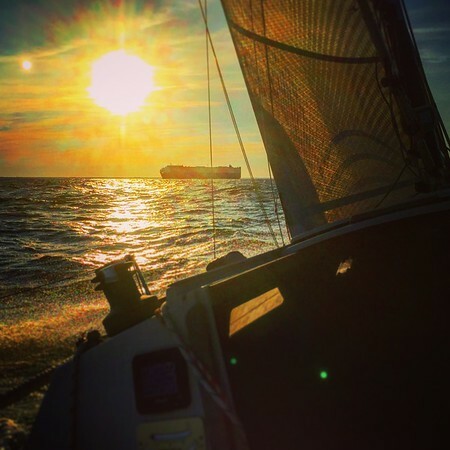 With the wind out of the south east, the first leg was a beat to the south in order to get good leverage on the trip across the bay and across the current to the cut channel 3/4 of the way to the other side of the bay. Unfortunately, we over stood just a little bit and our competition – J/109 Afterthought was a able to sneak just ahead of us for the trip up the channel. On the final leg back to the Piankatank we made ourselves comfortable on the rail for the hour+ close beat complete with sunscreen and beer while watching porpoises alongside the boat. We managed to claw back the lead Afterthought had put on us but couldn’t overcome it enough and were beat by a few seconds at the finish. 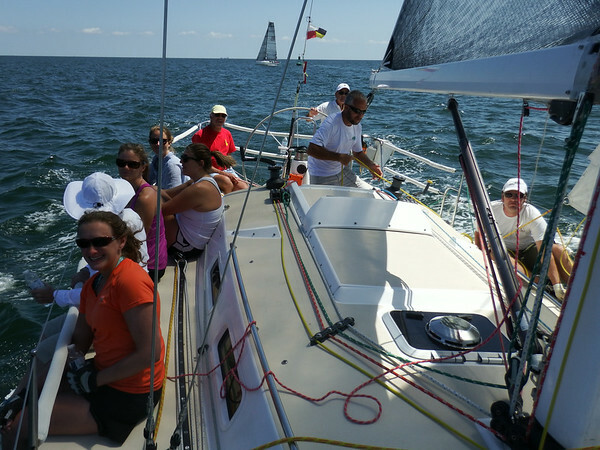 Two regattas down this weekend and the 3rd (of 4) would be FBYC’s Moonlight Regatta sailing aboard Double Eagle. It’s rare that I’m running the pointy end of the boat – but what better than to do it in the dark! Sam, Mark, Mayo, Holly, Melissa, Mary Paige, Katie and Mark(2) all made a great team and made for a great night. For the first time in my memory we were sent on the longer A course and we were able to correct over all of the other boats sailing that course. The cloudy conditions and a moon that didn’t rise until we were back ashore didn’t make for great picture taking so these will have to suffice. 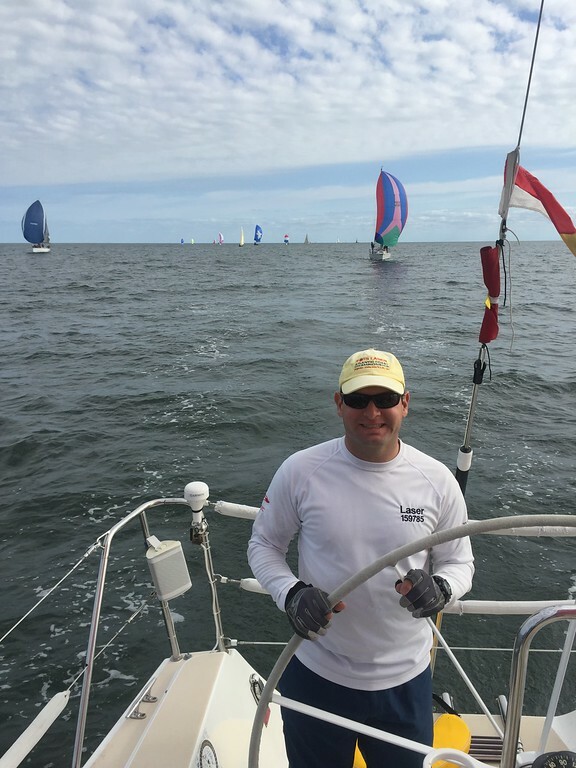 Fishing Bay Yacht Club‘s closing weekend started with a staggered start distance race for the offshore boats. I sailed on Wavelength for what might be our last race as the boat is now up for sale. 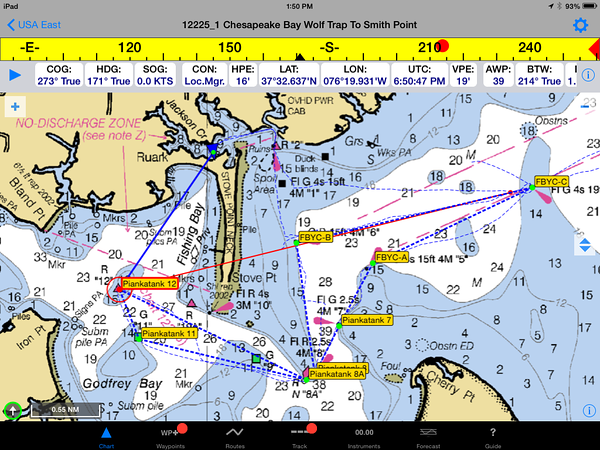 The course took us up into Fishing Bay and then back out by the entrance to the Rappahannock River and then back to Stove Point near Jackson Creek. It was mostly a reaching race and some boats were really able to get away from us and put some distance between us and them. We finished mid-pack, had fun and made it a great way to end the season. Racing was followed by a big oyster roast and pot luck and season awards. 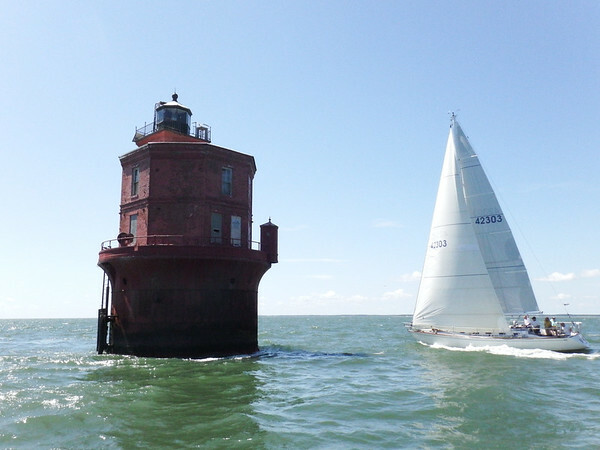 Saturday we raced Wavelength at Fishing Bay Yacht Club to the Wolf Trap Light House and back. Wolf Trap is a memorable place both because I’ve sailed my own boat there and because it was the first race I ever did on a ‘big boat’ on Wavelength in 1998 after joining FBYC and getting my drivers license. The weather was perfect for a race with winds 12-19 out of the SSW and mostly sunny skies. We had a good start and were 2nd boat around the short windward mark. The next leg was a little less than a mile downwind and chose not to go with a spinnaker and lost a couple spots to the boats behind us. On the close reach out to the Milford Haven mark we had a full main and a No 1 up which was more sail than anyone else and held our ground and may have even picked up on some of the faster rated boats. From Milford Haven to Wolf Trap was a beat with a heavy current behind us. Once around Wolf Trap it was all downwind directly into the current. As we got closer to the Piankatank the wind moved forward and it became a close reach again. 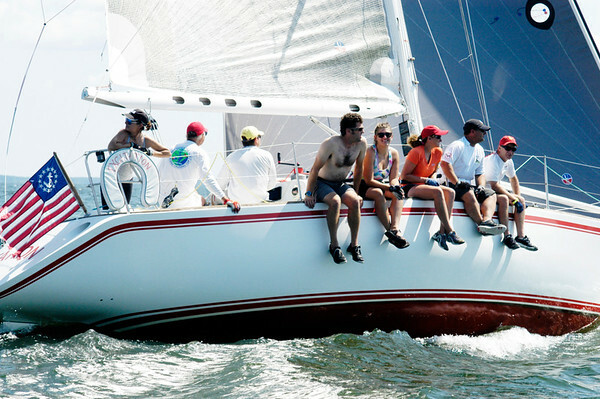 The final leg was a beat up the Piankatank and we ended up 2nd in the 4-boat PHRF-A fleet behind Nanuq. 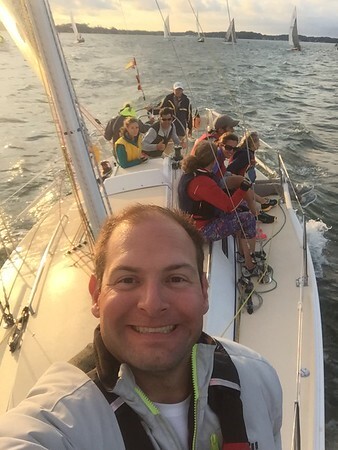 Friday I started the weekend early and sailed the Stingray Light Distance race at the Stingray Point Regatta at Fishing Bay Yacht Club on Sam Mitchener’s J/109 Double Eagle. 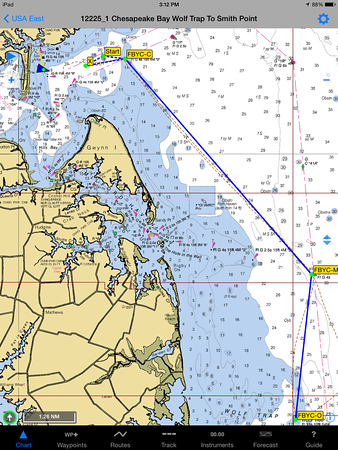 The course was a 13nm route that took just south and north of the Piankatank River entrance. In our class were Bad Cat, Nanuq, Wairere, Voodoo 2 and Pursuit. The wind was 8-11 out of the NNE with comfortable temperatures and mostly sunny skies. Our race went pretty well particularly on the upwind/close reaching sections, we lost a bit on the downwind, but still wound up with 3rd place overall. I got to do some bow work which was a change since I haven’t done that in quite a number of years. All in all a great day on the water.